Trapped in Melbourne, longing for the wilderness? Stuck in the burbs, dreaming of billabongs? Confined to your office, pining for the bush? Shackled to your laptop, grappling with your inner Clancy? Don’t despair; the outback is closer than you think. Just ten kilometres from the CBD, lies Melbourne’s own slice of untamed Australia – Studley Park. It rambles through stands of ancient gums and scrubby bush, over hills of unruly grass, along steep, rocky bluffs, all the way down from Kew to Collingwood and across from Abbotsford to the Eastern Freeway. 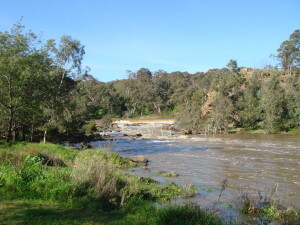 The Yarra River winds through it, slow and lazy for the most part, but breaking into rapids, tumbling down Dights Falls and spreading into a billabong. From the flat, grassy banks, there is no trace of the modern world. The view is from ancient times, when the Wurrundgeri people fished from the banks while their children swam in the shallows. The only sign of the nearby city is the hum of traffic on the freeway. It is punctuated by the calls of the native birds which refuge in the bush. Here, and in many other parts of the park, you are alone, in the remote and timeless bush. But Studley Park isn’t just a wilderness – a retreat for the solitary refugee from the big smoke. For the sportsperson, a picturesque, if somewhat rugged golf course spills across the hills through the trees; there’s a cricket ground; bike and walking tracks snake along beside the river where kayakers and canoeists ride the currents. For the gourmet, the extremely popular Studley Park Boathouse restaurant and café offers fabulous food with wide-angled views of the river and the bush. At the historic Abbotsford Convent, a grand gothic building set in tranquil gardens, the Bakery Café, Lentil as Anything restaurant and the Boiler Room bar, please a range of palates and pockets. There are barbeques and picnic spots for those who like to do it themselves. For those with a bucolic bent and most particularly for the kids, there’s the Collingwood Children’s Farm, where you can fill your nostrils with the pungent smell of manure, watch pigs, chooks and peacocks potter and strut, feed the goats, see the cow being milked, cuddle some very accommodating cats, wander among the vege patches and fruit trees and even ride a pony. There is something here, in this beautiful bush setting, for everyone.